‘The style of these drawings is beneath contempt’: these are the words of the famed medievalist and cataloguer M. R. James, whose strong opinions of the images found in Latin MS 69 have coloured recent perceptions of one of more curious items from the Rylands collection. In some respects James has a point. Not only are the illustrations sketchy and pen-drawn, but the text itself is written in a rough cursive hand that is difficult to decipher. However, despite its unprepossessing appearance, Latin MS 69 is certainly not without merit. The image of the sweeping woman on fol. 34r (fig. 1) provides a keen insight into the beliefs and fears of a populace for whom attack by evil spirts was an everyday, tangible threat. Fig. 1: Woman using a broom to sweep four demons from her house. Latin MS 69, f. 34r (detail). Erroneously recorded in the Rylands library catalogue as the Speculum Salutis, the manuscript is in fact a fragment of a late fifteenth-century copy of Ulrich von Lilienfeld’s Concordantiae caritatis (‘Concordance of Charity’, c. 1350s). The Concordiantae belongs to the typological picture book tradition that increased in popularity in the later Middle Ages. Building on the idea expressed in the Bible verse Matthew 5: 17 – “think not that I am come to destroy the law, or the prophets: I am not come to destroy but to fulfil” – such books juxtaposed images from the Old and New Testaments to express the concept of prefigurement. Scenes, figures or statements from the Old Testament (‘types’) were said to anticipate (or prefigure) the actions of Christ in the New Testament (the ‘antitype’). 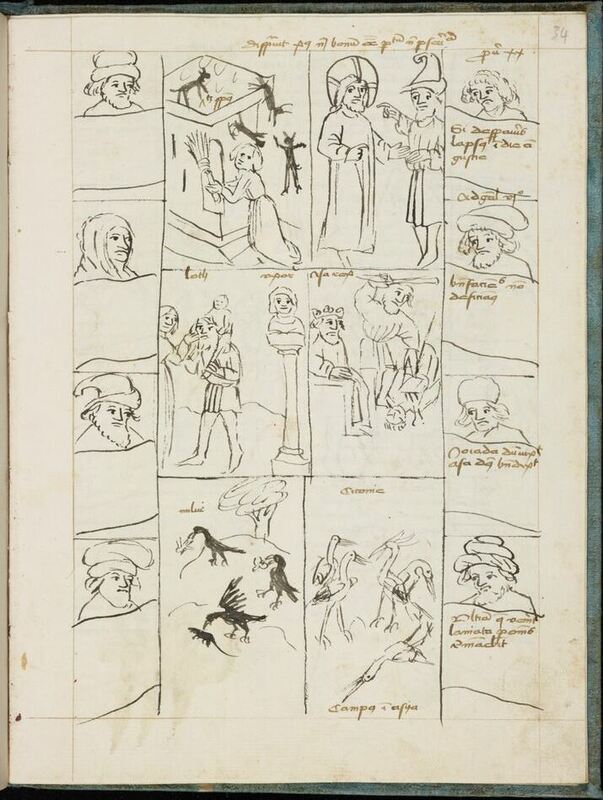 Unusually, allegories from natural history were also included in the Concordiantae pictorial schema. The moral message of the tale is clear enough: sins committed after baptism (or penance) are much worse than before. On a further level, warning is given to those who indulge in lechery, with the expulsion of the ‘impure spirit’ symbolising the expulsion of earthly desire. The placement of the Old Testament antitype of the destruction of Sodom in the middle register certainly highlights this point, as does the inclusion of a scene from the reign of Asa who, in old age, also began to embrace his carnal desires and neglect the authority of God. Similar allegories of the rejection of Divine Grace can be detected in the image of the kites eating flies, birds and mammals (i.e. an escalation of sinfulness), and the depiction of a group of stalks fighting to the death. Portraits of biblical figures, some with explanatory labels, frame the left and right-hand sides of the central diagram (fig. 2). Fig. 2: Typology of the Parable of the Unclean Spirit, beginning with top register: sweeping woman; Christ explaining parable; Lot flees Sodom, with wife as a pillar of salt; King Asa; kites eating flies, birds and mammals; fighting stalks. Latin MS 69, fol. 34r. 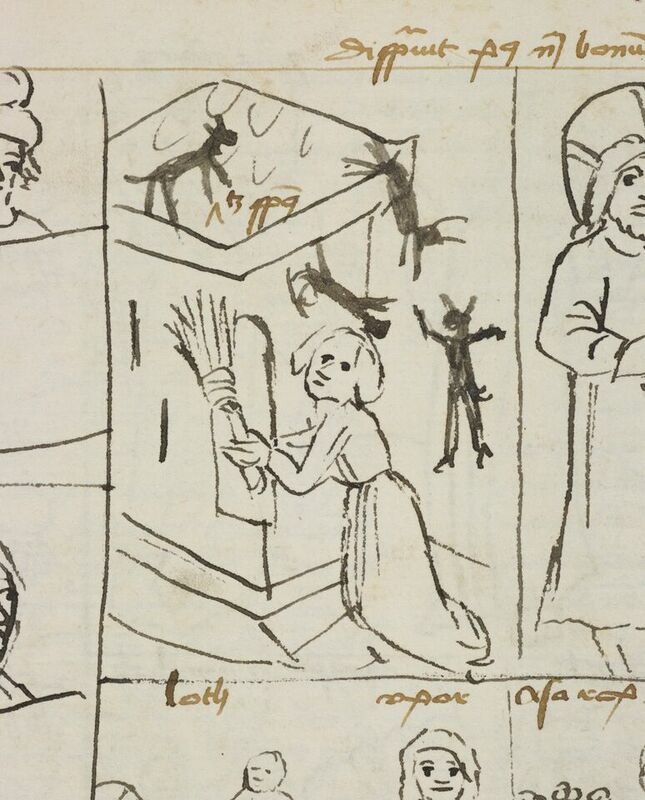 Where the illustration of the sweeping woman is concerned, the artist of Latin MS 69 seems to have taken a more literal approach to the parable’s message. Broom in hand, the woman is pictured trying to remove four animal-like demons from the roof of her household. The lack of space may be the reason why the full number of spirits/sins was not included in the final design. Nonetheless, the image would have definitely provoked an emotional response in the manuscript’s intended audience. The mystical, protective qualities associated with the act of sweeping were a fundamental part of local medieval life. Shrove Tuesday was seen as a traditional time to sweep the house clean, a practical manifestation of the act of being ‘shriven’ (i.e. spiritually cleansed) the day before the start of Lent. The act of sweeping could also have negative connotations, especially where its use by suspected witches was concerned. In a story from Rothenberg, Germany (c. 1652) – which, pointedly, was said to have taken place on Shrove Tuesday – a woman named Margaretha Horn was accused by her neighbour of causing his home to be infected by pests, having swept the waste from her own house onto a dung heap that was adjacent to his. By tapping her broom on the dung heap, she ‘activated’ the magical transference of vermin. Crude as they may be, the illustrations in Latin MS 69 demonstrate that manuscripts need not be aesthetically pleasing to be socially useful. To preach to the rustics, churchmen needed moral stories that spoke to the immediate circumstances of their audience. What better way to articulate the Lent sermon of the Parable of the Unclean Spirit – specifically, the dangers of turning away from God and being infiltrated by demons – than an image of the ‘magical’ cleansing of the household? And yet, the belief that witches could use sweeping magic to torment their neighbours may have added an extra sense of fear, uncertainty, to the drawing’s moralistic message. Thanks must go to Berthold Kress, for providing his research on the Concordantiae Caritatis, and to Elizabeth Gow, for originally directing the manuscript to the attention of the ‘Magic, Witches and Devils in the Early Modern World’ project team. Stephen Gordon is a Postdoctoral Research Associate on Jennifer Spinks’ Arts and Humanities Research Council-funded project ‘Magic, Diabolism, and Global Religion in European Print Culture, 1500–1700’ (grant number AH/L015013/1). One of the major outcomes of the project will be the exhibition ‘Magic, Witches and Devils in the Early Modern World’ at the John Rylands Library, from late January to June 2016. The exhibition will be co-curated by Jennifer Spinks and Sasha Handley, who both lecture in early modern history at the University of Manchester, and it has also been supported by The John Rylands Research Institute. It will feature the Concordantiae Caritatis alongside other works from the Rylands collection. Another fascinating glimpse of the work at Rylands. To go off at a tangent, I see from his own preface to his catalogue of the Latin MSS at Rylands, that M R James didn’t in fact visit Manchester to study them (somehow, one can’t magine him staying in a great industrial city), but that ‘the manuscripts were sent to me in batches’ at Cambridge (where he was at King’s College, I think). One imagines them being carefully wrapped and boxed and then taken by carrier to London Road station (goods department) for their journey by train to Cambridge. Equally intriguing is his comment that he had started work on the Crawford MSS. when they were still at Haigh Hall, Wigan (before Lord Crawford broke up his library in 1901). Do we know whether he lodged in that great grey mansion that owed its existence to the Wigan coal mines and iron works, or whether he had them sent to him from Wigan? James seems to have been a modest man, to judge by the disclaimers in his preface. He may not have liked the style of these drawings (perhaps not artistic enough for his taste), but, at any rate, the creatures depicted and the drawing of the woman sweeping out the demons accord with the spirit of his tales of ghosts and mysteries from olden times! The drawings of storks and the black birds are fascinating – do we know the latter are kites, rather than, say, corvids – are kites named in a biblical passage that the author is representing? Many thanks for your interesting comments. M. R. James began to catalogue the Latin manuscripts early in 1901 while they were still in Lord Crawford’s possession. On 30 November 1900 he wrote to J. P. Edmond, Crawford’s librarian, “If you were in a position to send me a box of books on or about the 15th [January], I could begin work on them. & when I went away from Cambridge I should place the books in our College Library [i.e. King’s], which is accustomed to taking care of such things for me…” Sixteen manuscripts were sent by train to Cambridge. I don’t think James ever visited Haigh Hall. When it came to his fee, James was certainly modest; in fact Crawford thought “it becomes almost ridiculous” and insisted that he was paid appropriately (letter to Edmond, 28 February 1901). When negotiations began in July 1901 for the sale of the Crawford manuscripts to Enriqueta Rylands, all the items out on loan were recalled back to Wigan. James was said to have sixteen items (presumable the original batch). James resumed his cataloguing of the Latin manuscripts in 1905, now for the Rylands Library, under a similar arrangement, with the manuscripts being sent in batches to Cambridge. The catalogue was finally published in 1921. You raise some interesting questions about the birds depicted in Latin MS 69. I’m no ornithologist, but there must be someone out there who knows a thing or two about representations of birds in the Bible and medieval folklore. Thanks for the quotes from MRJ, John – you have some of his correspondence there? Pity he never made it to Wigan, though! Many thanks for your comments. As author of the piece I can hopefully shed some light on the depiction of the birds. Although it’s quite hard to read, the label next to the tree in the bottom-left picture says ‘milvi’, suggesting that they are indeed kites. The explanatory text on page, fol. 33v (not pictured), says that they ultimately die of hunger through the lack of divine grace, but I’m afraid I don’t know the exact source text. Interestingly, some of the information about the storks seems to have been taken from Pliny’s Natural History. Thanks, Stephen, for the confirmation – very interesting. Dear Mr Gordon, not knowing a great deal about these things, but finding the subject of great interest to me, I wonder perhaps could the kites be ravens? I believe that ravens are a familiar of witches in European mythology. I also believe that ravens, as we know who are a member of the crow family, the carrion birds, are depicted in the Bible as both good and bad. The raven appears in ‘Genesis’ as well as in ‘Kings’ and as far as I know Noah sent out a raven to find dry land before the dove. The raven flew backwards and forwards but did not find dry land. It was condemned to live off carrion, turning black. The raven is also, was once believed to take the souls of the departed to the land of the dead. I’m just curious, and wonder what the significance of the creatures ( the flies, birds and mammals) are being eaten by the black birds in the illustration? Are they illustrations of creatures of pestilence and disease?